245 × 121cm. 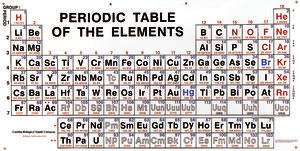 Giant-size periodic table is made of 100% plastic, corrugated cardboard; will not tear, warp, or discolor. Hinged to fold to 4 × 2-ft size. Type style and 3-color printing assures maximum visibility. The chart is self-supporting on a desk or is easily mounted in an out-of-the-way place such as the corner of a room.